OneClick Cleaners has designed a developmental opportunity for qualified sales professionals, conducive to the growth of OneClick Cleaners while rewarding these new partners with shared franchise fees and guaranteed residual royalties. Low Overhead: Franchise development operations can be run with little office space or from a home office. Typically, you will operate the franchise development business yourself. Once you reach a certain level of growth and success, you may opt to hire other personnel to assist in your operation. Wealth Building: Franchise developers earn both a portion on upfront franchise sales as well as ongoing royalties. 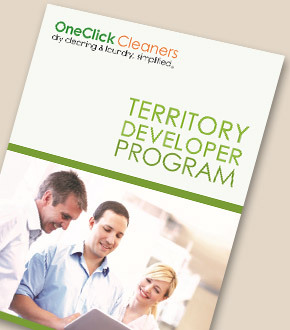 What is a OneClick Cleaners Franchise Development Agent responsible for? Franchise development agents are responsible for the recruitment, qualifying and sales of individual franchisees. You will act as an ongoing business coach to your franchisees to help them succeed, and in turn grow the value of your business and royalty stream. If you have the background, experience and are driven to take on Franchise Development, then let's start you earning today. Click here to fill out our Developer application!